The best gifts or décor elements are often handmade… but let’s be real, DIY projects can be tedious, time consuming, and expensive AF. 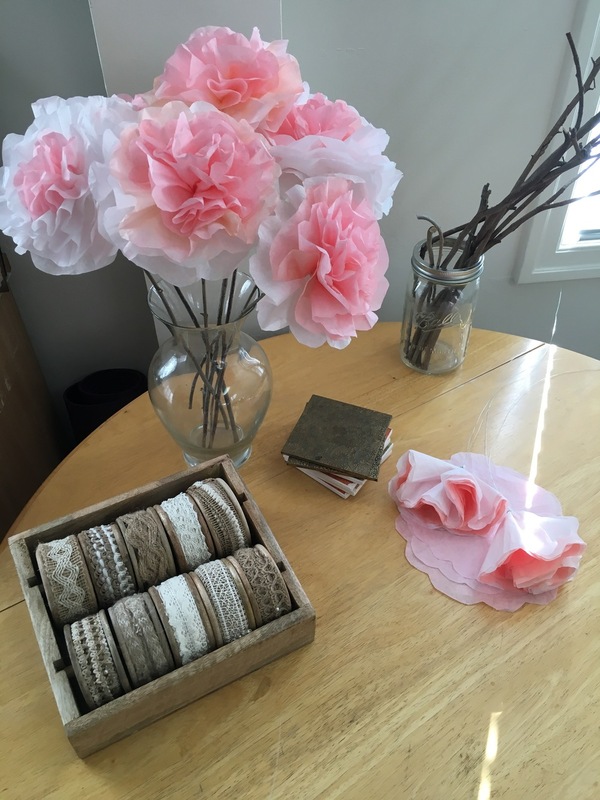 My Mother's Day DIY gift of choice this year turned out so great I thought I’d share a little tutorial with you, especially as these flowers are so versatile – perfect not only as gifts, but party décor, wedding/shower centerpieces, you name it. This was my first time attempting these and they turned out looking awesome with minimal fuss/time requirement. The best part about them? Supplies are minimal and VERY easy on the wallet! Dye your coffee filters! My method was to flatten out a stack of filters (maybe 10 or so) then fold the stack in quarters so I ended up with a cone shape, which I dipped the ends of into water dyed with food coloring. I also dyed some filters with a few different types of tea (red and orange tones), which turned out pretty and (bonus) the flowers had a nice scent. Lay your filters flat to air dry (they don’t take long – half an hour at the most). Take your scissors and “scallop” the edges of your coffee filters to create petal shapes (see the flat filters in the first image). This does not need to be precise and if your filters don’t end up perfectly round after that’s no problem either. Take a stack of dyed filters, fold it in quarters so you end up with a flat “pizza slice” shape, and then scallop the edge using your scissors. Note* if you only have a single size of filters, you’ll want to cut some of your filters smaller, so you end up with two stacks of different sizes. Scallop the edges farther down on a few stacks so you take off more edge, reducing the size. Stack 3 smaller filters (dyed & edges scalloped) on top of three larger filters (also dyed & edges scalloped). Fold the stack in half and pinch at the bottom middle point, then take your other hand to unfold the stack and pull it upwards away from the area your pinching. You want to end up with a cone like shape and a flat pinch point that you can stick a needle or safety pin through to create a hole. Once you’ve made a hole through the “pinch point” run some floral wire through the hole, and wrap/twist it around to create a flower base (see below photo). You’ll want to use a good amount of wire here, maybe two feet, to ensure you have enough wire remaining to attach your flower to its stem. Next, start in the middle and pull each filter up individually, and pinch/twist at the center to fluff up your flower and create the appearance of petals (see below photo). Last but not least, take your stems and use the remaining wire to attach the base of your flower to the stem (wrapping/twisting). After you’ve attached the flower to the stem with wire, take some floral tape and wrap it around the base to cover the wire and further secure the flower (see photo below). Wrap the tape tightly and make sure that you squeeze it against the wire and the stem so that is adheres well. The tape will be tacky on both sides. Want to add a little more flair?